On occasion, members may want to see the history of exactly what has happened to a document, task, or milestone. This information can be useful when tracking the progression of a document or task, or the work-flow patterns of a workgroup. It is possible to see whether activity has taken place within a particular document, task or milestone by using the Audit Log. A Company Administrator can enable this company-wide to all workspaces, or a Workspace Administrator can enable Audit Logs for a single workspace. At the company level, this can be done by navigating to the company admin menu (gear icon in the top right) and selecting Company Setup > General > Workspace Defaults, selecting Yes for Enable Audit Log on Workspaces, and click Update. This changes the default setting for any new workspace created but can be applied to all workspaces currently in use across the company by checking the box labeled Apply this change to all existing Workspaces before clicking Update. At the workspace level, a workspace admin can enable the Audit Log by navigating to Settings > General Settings > Access & Security > selecting Yes for Enable Audit Log. After making your selection, click Update and the changes will apply only to that workspace. 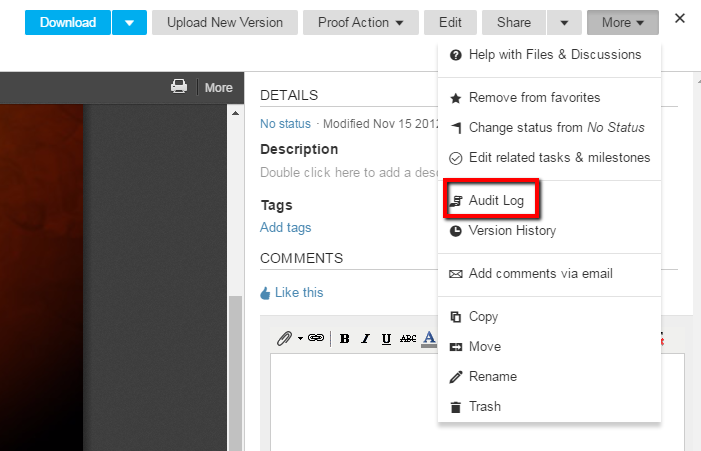 Regardless of when this feature is enabled, the Audit Log will display actions back to when the workspace was created. Once activated, a tab labeled Audit Log will appear at the bottom of the task, milestone or database record detail page. For files located in the Files & Discussions, the audit log is available by clicking on the more tab while you are in the file preview mode. Audit logging is not available in discussions. When viewing a workspace Audit Log report you are linked to the pages associated with the actions. Actions triggered by workflow are attributed to "CD System User"